Ever read a book, enjoy it, but think, I think this would make a much better movie? That was how I felt about Atlantia. I read it rather quickly and enjoyed the story, but could really picture it making a much better screenplay. I read the Matched series by Condie and liked them well enough, but this is my new favorite Condie book. I enjoy her writing style and find myself entranced by the worlds she constructs. Atlantia was no exception. Let me start with my favorite part: the worldbuilding. Atlantia was vividly painted, though there were some minor things (ie, lighting) that made it difficult to picture. In my head, Atlantia is beautiful. And Rio, the main character, confirms that, in a way. But it’s also claustrophobic, stale, and regulated. I loved the way the religion was constructed, the miracles, the sirens, Below and Above, the temple, the chores. It was beautiful, and easily my favorite part of the story. As a kid, I always had a fascination with Atlantis—this reminded me of that. I did feel that the characters fell flat. Aunt Maire was by far the deepest character, but I would have liked to see more from Rio and True. Their relationship was very subtle until boom, it wasn’t. It was a little offputting. The first half of the story was slow, but the worldbuilding made it worth it. 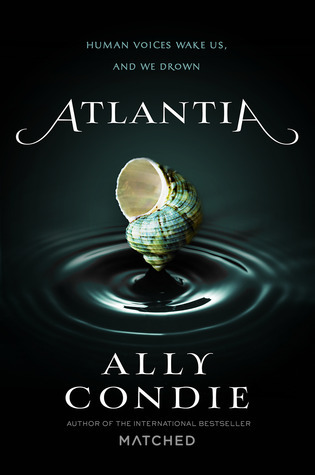 It wasn’t dumped in the first chapter—it was spread out evenly for the first half, giving the reader a well-rounded view of how Atlantia operated and what it looked like. Overall, I really did enjoy the story, but I wasn’t wowed by it. I rated it 3/5 on Goodreads and would recommend to those interested in YA Fantasy or those who enjoyed Matched. I will definitely read any future YA Fantasy stories that Condie puts out. I really, really wanted to love this book. It hooked me right away and it’s such a different, intriguing story that I had such high hopes for! But, it fell totally flat for me. The way that the entire story is laid out just felt off. To me, it was all of this build up to figure out why Bay made the decision she did and if she left any ‘messages’ for Rio, and then when you do finally figure out why? It was boring. Nothing exciting – just your typical plot twist that I totally saw coming. While I liked and connected with Rio, most of the time I was extremely annoyed with her stubbornness. If she just listened in the first place and wasn’t so selfish or arrogant, she could have figured everything out way sooner! I did really enjoy the parts where Rio went out on a limb so to speak and did things that she never would have before (like swimming) and loved the connection she had with True. She was very weary of having any type of relationship with him at first – whether just friends or romantic – and it was nice to see her open up a little. I wish we could have seen more of that. It also would have been nice to see more of her relationship with Bay before Bay’s decision – having a bit more of a basis to know why Rio felt how she did would be nice. I’m not a twin so obviously I don’t understand what it’s like when you find out they’ve been keeping secrets from you, and the writing made Rio’s reaction seem so… bratty and selfish. Never once did she put herself in Bay’s shoes and she refused to listen when True or Aunt Maire thought they could help until all of her other options were gone. I love Condie’s writing style and world building and most of the characters (especially True!). The story itself though? Didn’t do it for me at all. Lauren is right – it would have made a much better movie than book. I rated it 3/5 on Goodreads and would love to see a book about Rio’s mom Oceana and Aunt Maire, or even about True and his life before Rio, but am overall really glad this is a stand alone novel.